The SEG-30 static electric Grounding Device adapts to all Mustang Squeeze Tools manufactured since 1972. An adapter is screwed into the upper jaw grease fitting tapped hole which provides a grounding strap terminal and a passageway for lubrication grease. A 5-foot insulated braided copper cable connects the squeeze tool to a 12” copper cast spike which is inserted into the earth adjacent to the work area. Bronze casted handle and terminal lug completes the device. 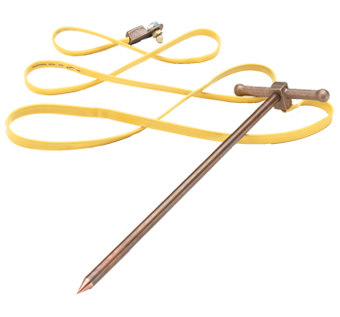 Frayed cable ends can be trimmed away and re-inserted into the machined bronze castings. The SEG-30 terminal lug provides a large area path to ground and should be permanently attached to the tool. Use of alligator clamp attachment is not recommended due to minimal contact area of the clamped teeth.